When people find I crochet, it’s a matter of weeks–days sometimes– before they ask if I can make one project: a crochet beard hat. Friends, family, and strangers have e-mailed, texted, even posted pictures on my Facebook wall, requesting this odd item. 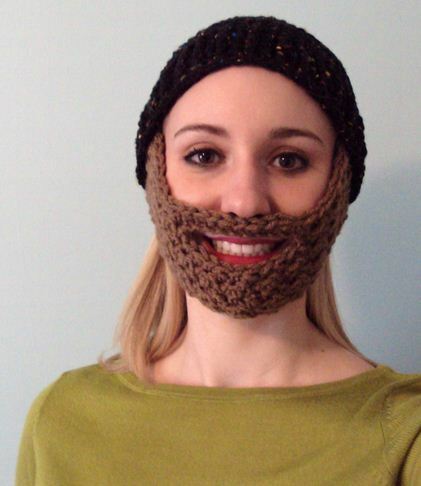 Crocheted beards hold some inexplicable intrigue. That’s why I was delighted to come across Lauren Strasser, a crochet designer who blogs about life at The Production Department. 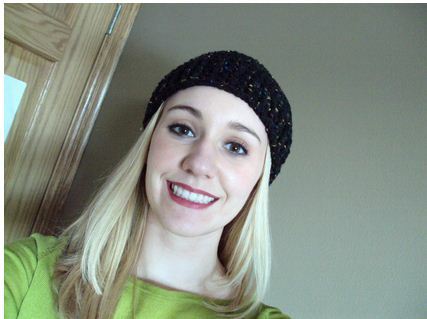 Lauren has been crocheting since she was 15, but really started cranking things up when she was 19. The lumberjack look is so hot this season. St. Paddy’s Day leprechaun costume? My beard is way comfier than this beard. I had been wanting to make a beard hat for awhile, but all the patterns I could find online weren’t quite what I was looking for. My wish list included: a big enough mouth space, ear coverage, and full chin coverage. So I made my own and now you can too. I loved using the foundation chain (fch) stitch in this pattern. The foundation chain lets the beard be stretchier than using a plain chain would allow. And stretch is key when you’re pulling this hat on like a face mask. The foundation chain also makes the mustache area just a tiny bit thicker and we don’t want any wimpy mustaches around here. Here’s how to do the foundation chain (dch): Chain 2 Insert hook into 2nd chain from hook. Yarn over, pull up a loop (2 loops on hook). Yarn over, pull through both loops (1 loop on hook). First fch made. 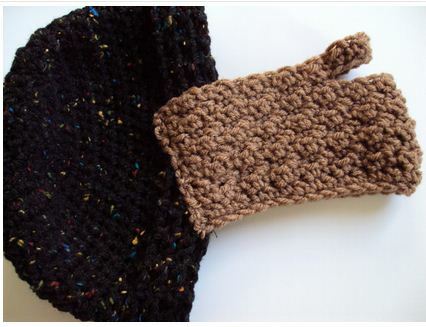 For remaining fch stitches, insert hook under the strand to the left (if crocheting right handed) of the hook, yarn over, pull up a loop, yarn over pull through two loops. Row 1: Chain 1 (counts as first sc now an throughout), * dc, sc *, repeat * to * 15 more times (31 stitches). Row 2: Chain 2 (counts as first dc now and throughout), * sc, dc *, repeat * to * 15 more times (31 stitches). Rows 3-8: Repeat rows 1 and 2. Row 10: Repeat Row 2 (31 stitches). Optional step: Hold the beard up to your face, look in the mirror, and laugh until your sides hurt. Now sew the beard to a hat. Row 1: Chain 1 (counts as first sc now an throughout), * dc, sc *, repeat * to * 9 more times (19 stitches). Row 2: Chain 2 (counts as first dc now and throughout), * sc, dc *, repeat * to * 9 more times (19 stitches). Row 10: Repeat Row 2 (19 stitches). I used this men’s free crochet hat pattern (from JJCrochet). Here the hat is inside out to show approximate placement I like. The beard goes smack dab in the middle of the hat then the front tilts up an inch or two. Just sew along the edges of the beard, not all the way to the edge of the hat. You’ll see why soon. I think it looks like a football helmet when it’s turned inside out… Anyone else? 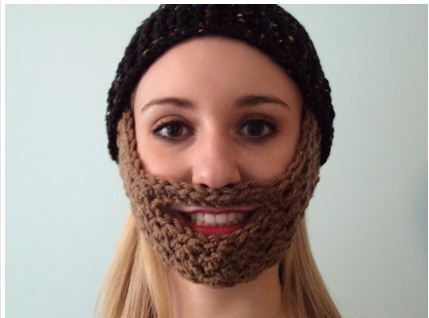 You are now the proud owner of a beard hat! Gift it away, stay warm outside, and make up a stack for your jealous friends. If you already have too many projects in process and don’t have time for this one, you can head over to my blog and order a custom made crochet beard. Many thanks to Lauren for creating this fantastic pattern and allowing me to share it. Currently, my workplace is participating in “Full Beard February” (no joke – it’s a real thing), but being a girl, I was feeling left out. After Lauren’s pattern – no more! I was so excited for this beard pattern and immediately tested it out to make myself some facial hair. I can confirm it is the most bizarre, most wonderful thing I have crocheted for myself in a while. I tried the beard on, checked myself out in the mirror, and laughed myself silly. I guarantee it’ll be an instant hit when you crochet one. Lauren’s favorite yarn to crochet with is Red Heart worsted weight and her least favorite chore around the house is vacuuming the stairs. The best part about her day is her lunch time where she spends her a few precious minutes crocheting or reading. During the week, she teaches 25+ preschoolers at her church and couldn’t be happier. To learn more about Lauren’s crochet work, visit her at The Production Department.